Links on the Wyandotte County web page may not be specifically within the site itself. If you find a link that does not work, please mail the URL to Patricia Adams. Thank you. THE EDUCATION OF MEXICAN-AMERICANS IN KANSAS CITY, KANSAS - 1916-1951 - A THESIS IN History Presented to the faculty of the University of Missouri-Kansas City in partial fulfillment of the requirements for the degree of MASTER OF ARTS by ROBERT MARTIN CLEARY; B.A., Hunter College of the City University of New York, 1981; M.L.S., Rutgers University, the State University of New Jersey, 1993; Kansas City, Missouri 2002. "The Wyandot Indians, 1843-1876" by Robert Emmett Smith, Jr. The History of the Public Schools of Kansas City, Kansas - Wyandotte County, Kansas, 1819-1961 by Nellie McGuinn, a public school educator in Kansas City, Kansas, who (in January of 1961) presented this history to USD 500 in answer to a request from the Superintendent Frank L. Schlagle. Her manuscript takes a look at the settlement and growth of Kansas City and Wyandotte County, Kansas. We are grateful to Ms. McGuinn for her contribution. North American Aviation - Kansas (Fairfax District) - For former employees of the North American Aviation plant in Kansas City , Kansas during WWII and others interested in the B-25 aircraft. The Winding Valley and The Craggy Hillside - A History of the City of Rosedale, Kansas by Margaret Landis. Copyright 1976. Reproduced on the Kansas City, Kansas Public Library web site with permission from Ms. Landis. Individual school histories contain excerpts from A History of Black Education in Kansas City, Kansas, Readin', 'Riting, 'Rithmetic by William W. Boone, March 1986 (Copy located in the KCKs Public Library, 625 Minnesota Ave, KCKs, 913-551-3280). The school district is sincerely grateful to Mr. William W. Boone, Ms. Josephine C. Vandiver, and Mr. Jackson C. Van Trece for their research and preparation of this material. KCKS Public School System, 1819-1961 by Nellie McGuinn, public school educator in Kansas City, Kansas, who (in February of 1966) presented this history of the KCKs public school system to USD 500 in answer to a request from then former Superintendent Frank L. Schlagle. Her manuscript takes a good look at the settlement and growth of Kansas City and Wyandotte County, Kansas, incorporating the history of our schools. The history written by Ms. McGuinn has been used for information on the individual buildings throughout the web site, although the entire book is on this web page. We are grateful to Ms. McGuinn for her contribution to the future . . . "our written history". Vernon School is Officially Historic: Sept, 2004 - "The Vernon School, a haven of education for African-American students prior to school integration, has been placed on the Register of Historic Kansas Places. The Vernon School, built in 1936, is a one-story brick structure located at the corner of 27th Street and Sewell Avenue. The current building was build as a replacement for the Colored School of Quindaro, which served freed slaves, but had become overcrowded and a fire hazard. The school was named for Bishop William Tecumseh Vernon, a president of the defunct Western University, which also served African Americans. The Vernon School was an all-black institution until 1972, when Quindaro Elementary School was built as part of the KCKs Public School's desegregation efforts. "A History of Wyandotte High School" by Ferne Vesecky, editor of the Pantograph. Written 1931-34. On-Line Book - History of Wyandotte County, Kansas (Vol 1), by Perl W. Morgan, 1911 Polish friends: Do you know these people? Post your surname data to the Kansas Surname List Officially volunteer to look up answers to queries if you have access to books, libraries, etc. 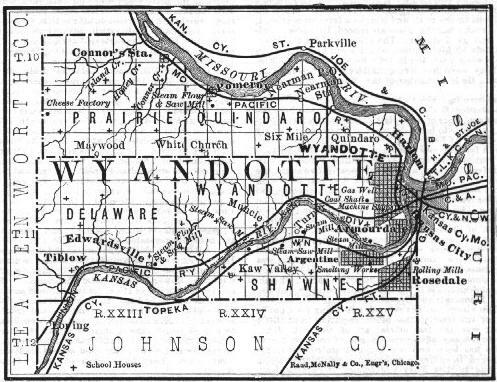 about Wyandotte County, KS genealogy and would you be willing to try to answer other people's emailed questions. Send your name, e-mail address, resources (books, cemeteries, libraries, etc). Can you help answer any of these Queries and Messages? Thanks to Helen E. Bortz , the "1881 Gazetteer of the New Southwest" is now online. Information includes counties, cities and towns of southwest Kansas, southwest Missouri, northwest Arkansas and Indian Territory as well as a business directory of St. Louis. Check it out and if there is anything you think might benefit your county visitors please feel free to link to our page. Create your own Family Calendar.